Canadian Nick Starchuk, a well-known golf coach in Ontario golf circles, formerly worked at prestigious Glen Abbey Golf Club. In the past year, Starchuk has brought his game south to Florida where he is learning a new system of golf instruction at the elite GaryGilchrist Golf Academy, which is based at Mission Inn Resort near Orlando. Besides learning a new style of coaching, Starchuk hopes to become a certified Gilchrist Coach – adding to a variety of certifications he already features in coaching, fitness (TPI and Canfit) and sports psychology (Golf Psych). Posture may be viewed as the foundation of a golf swing. It sets the angles for a strong foundation so that the body and club can move through the appropriate planes of motion. If you happen to be on the practice tee for a PGA Tour event, you will notice that players set up slightly differently but to the knowledgeable eye, there are many things that are similar in this structure. Given the many different body shapes – tall, short, long or short arms – the look of the posture may change. However the principles of posture remain: a strong foundation with great balance in order to make an athletic movement. The first thing that one might notice is the balance of each player, where the knee bend, hip bend and their initial incline to the ground are all very similar. When the knees and hips bend the right amount, the player will be well balanced from toe-to-heel. And hopefully, with the correct degree of spine tilt away from the target, the weight is even distributed from left-to-right. From a glance, the knees and shoulders should line up on top of each other. Since most golfers are unaware of poor posture, we have a few “feeling drills” that I like to describe as “Generic Drills” which can help maintain a strong, athletic setup. 1. Thigh Pushes – Hold the club parallel to the ground out in front of you and place the shaft across your thighs. With a slight push, you will notice how your body adjusts into a ‘sit down’ position and mirroring a strong posture. 2. Stand Tall and Bend – Stand tall and grip the club as you normally would. 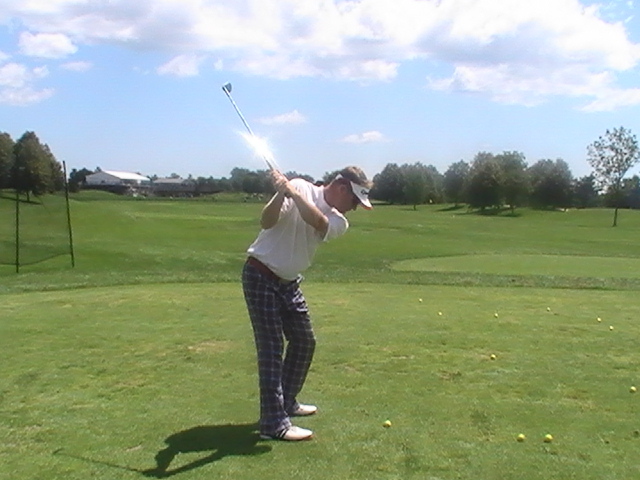 From here, with a little flex and bounce in the knees, bend forward from the hips and then drop the club to the ground. You may notice that the arms fall straight down and the club head lies on the turf. This is also a good way to monitor your ball position as it relates to the distance from your feet. 3. Shaft on the Back or the Front – Both ways provide the same feeling. With the shaft touching your tailbone and the back of your head, bend from the hips and assume a golf position. The next step is to drop your arms and grip the club, and with this, comes a small rounding of the shoulders and upper back. The lower and lower-mid back is the angle that should be maintained when we hear the term “spine angle” mentioned, but the thoracic (upper and upper/mid) is the mobile part of the spine, and as such, changes its position relative to the ball. This might feel foreign but the object of these drills is to provide feedback to how posture should feel. If it does not feel right, then you know your posture needs attention. Since posture can dictate your swing plane, it is often described as the most important set up procedure – the other being the grip. If these two fundamentals are consistently monitored, your ball striking and accuracy should always improve.